Hey guys! Third installment of the comic! The first clue to Miller’s immortality has been revealed. Can you guess what his secret is? Let me know what you think! LOL! I never knew Miller’s hallway, room, and carpet were all blue! Well…blue is his favorite color…. What’s with the gangsta smurf? what the hell is in your hand alex and why are you staring at my ‘rear end’!!! Okay, lol, I am holding a broken guitar in my hand. As for the ‘rear end’ thing…well I could be saying “Nice.” To the flaming feather, or I could be complimenting the view….I guess the world will never know. @Cody & Carter: The whole smurf thing started cause my Spartan on Reach is pretty much all blue…even the visor…so Flanders started picking on me about it ever since. 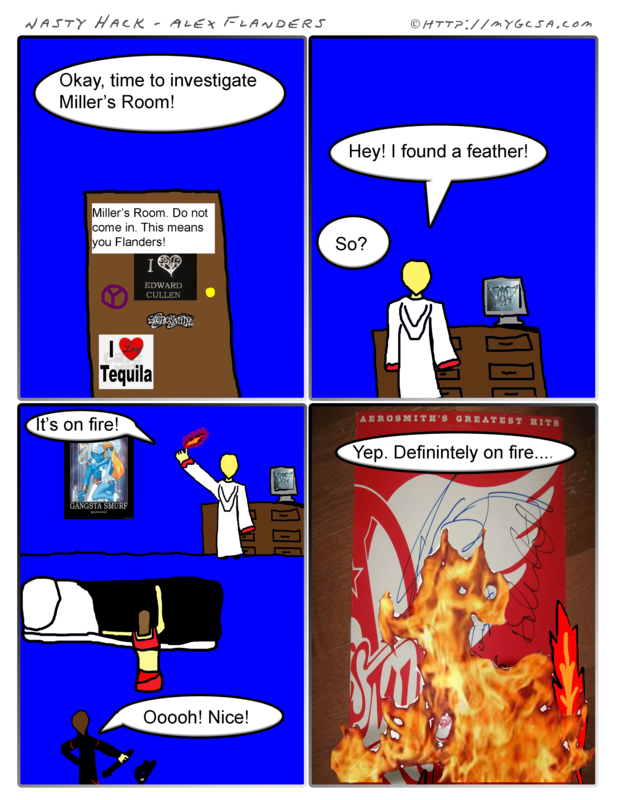 @Flanders: I think I should shank you…you know the 4 reasons why just off this comic…plus…why the girly-looking I love Tequila poster? Lol…oh and don’t be surprised if there’s team killing. Miller, I beg to differ! Clearly your room is all blue! The comic proves it! Secondly, while this comic is bad, look on the bright side. At least it’s not next week’s comic. Now that one is REALLY bad. Oh, also as for the tequila poster…well…I figured that would be obvious. I’ve seen next week’s comic with my own eyes. Miller, I am so very sorry for what February 25th holds for you. Just know, it was all Flanders. …There’s gonna be team killing. Ok Flanders I take that back…my bed has blue sheets…other than that there’s nothing else blue lol. And you will see Miller. You will see! Yeah, yeah, that you are…and to have a margarita.